Wuhu Island as it has appeared in the Smash series. Wuhu Island (ウーフーアイランド, Wuhu Island) is a stage in Super Smash Bros. for Wii U and Super Smash Bros. 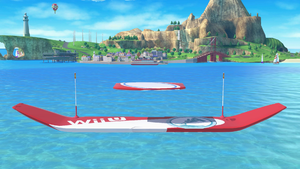 Ultimate, based off of the island in Wii Fit, Wii Sports Resort, Mario Kart 7, and Pilotwings Resort. The stage travels over Wuhu Island on red and blue platforms. The stage stops in multiple locations on the island, similar to Delfino Plaza and Skyloft. Frisbee Dog Park - One long grounded platform, made up of sand. A Mii appears with his dog in the background, throwing a Frisbee for it. Swaying Bridge - A floating semisoft platform made up of a long bridge. There are several gaps in the bridge that characters can fall between. The boat - A moving boat that works similarly to Pirate Ship from Super Smash Bros. Brawl, albeit facing the other way around. Characters can swim in the water surrounding the boat, but there is a current pushing them to the left. If a character hits the hull of the boat, they will be meteor smashed for an OHKO. Rocks at sea - A group of rocks that make up platforms in a part of the stage which is otherwise mostly water. Maka Wuhu - The top of the volcano, which characters can fall inside to be KO'ed. Two platforms surround the left and right sides of Maka Wuhu, both inside and out. Boating gate - A platform above sea, with walls on either side, and a small platform to stand on at the bottom on each side. Miis can be seen powersailing through the gate. Characters can swim in the surrounding water. Wishing Fountain - A grounded area, with a large fountain in the center. The fountain can push characters upwards. Swordplay Colosseum - Comparable to an Ω form, this is a single aerial platform. A crowd of Miis watch in the background. Talon Rock - A pointy rock close to the swaying bridge, consisting of a slight slope and an abyss. A balloon will appear and can be popped, giving 10% to anyone near it when it pops. The floating platform that carries characters to each location is semisoft, and changes layout with each appearance. With hazards off the stage stays in it's inital form, moving around the island but never stopping. In Super Smash Bros. for Wii U, the Ω form is a thicker version of the base of the first platform. The stage tours the island in a fixed path and won't stop at any places of interest. However, unlike the default form of this stage, characters can get Star KO'd here. In Super Smash Bros. Ultimate, the Ω form and Battlefield form are set on the Swordplay Colosseum platform, resized and reshaped to match Final Destination and Battlefield, respectively. Just like the regular Swordplay Colosseum, it features Miis spectating in the background. The three soft platforms of the Battlefield form are light blue and are unique to this form. Wuhu Island as it appears in Wii Sports Resort. Wuhu Island first appeared in Wii Fit, where some workouts would take place in various areas of Wuhu Island. 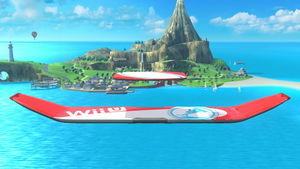 The island would later make a more detailed appearance in Wii Sports Resort, which featured a Free Flight game, allowing Miis to freely fly to any area of Wuhu Island, much like the progression of the stage in Smash 4. This would later be expanded upon in Pilotwings Resort. CPU Miis in the background would be replaced with the ones saved on the Wii if any are on it. In Smash however, they are preset to the CPU Miis regardless of whether any are saved on the system and do not change. Wuhu Island trophy in for Wii U. The tropical island from Wii Sports Resort is the perfect place to enjoy a few sporting activities. 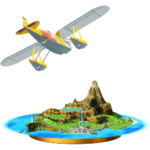 Go on a close tour of it by selecting the Wuhu Island stage, or get a bird's-eye view of the island with the Pilotwings stage. Just don't get too awestruck—with the stage constantly changing under your feet, you can't afford to lose focus! The Plane flying through Wuhu Island. The boating gate, zoomed in. Dr. Mario on Talon Rock in Ultimate. Greninja with a Substitute doll after tripping on the stage. Olimar ascending with Winged Pikmin in his red costume with Alph on the stage. The yellow seaplane from the Pilotwings stage can be seen flying in the background. In addition, Wuhu Island itself appears in the stage, meaning both stages take place at the same location, despite being from different universes. The Super Smash Bros. logo can be seen on the platforms, on the right side of them. Interestingly, the Wii U logo has not been changed in the Ultimate iteration of the stage. This and Dream Land GB are the only stages which had the backgrounds of their Omega forms significantly changed between Smash 4 and Ultimate. This page was last edited on April 20, 2019, at 13:16.